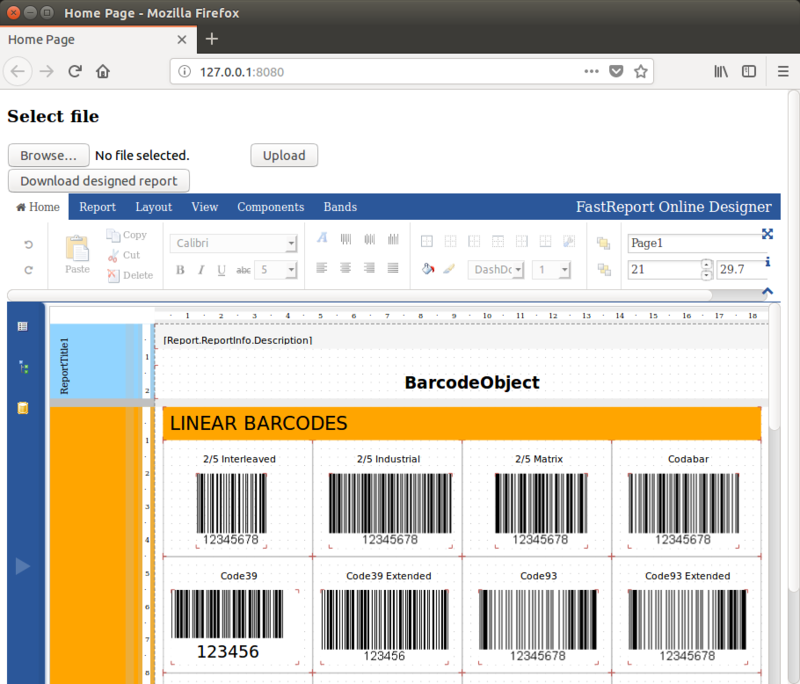 How to use an online designer in a web application .Mono - Fast Reports Inc.
Those who came across with an online designer in FastReport.Net certainly appreciated all its advantages and, working with FastReport.Mono, would like to use it in their web applications. In fact, there is nothing complicated. Today we will look at the way to create a web application in MonoDevelop and to use the online designer in it. Download the zip archive with an online designer that you have assembled in an online designer on fast-report.com. Unpack the archive and add the WebReportDesigner folder to the project root. We also need a folder in which we will save reports, store a file with data. Add the App_Data folder to the project root. We will use demo reports from the FastReport.Mono delivery, so we will need the nwind.xml database. Add it to the App_Data folder. Let’s consider it in more details. Previously, we created a web report object that is accessible inside the class. In the Index () method, at the beginning we set the size of the WebReport object - height and width at 100%. After that we create a data set. And we load into it the xml database. We register the data source in the report. We check if the report template file exists and, if it is successful, load it into the report object. This is followed by the settings of the web report object. Turn on the report editing mode, which allows you to display the online designer. Then, specify the path to the designer page. In the next step, we set up a view to display the callback when the report is saved. The last setting is the identifier of the report object. We will need this for a View in the future. Using ViewBag, we pass the report object to the view. 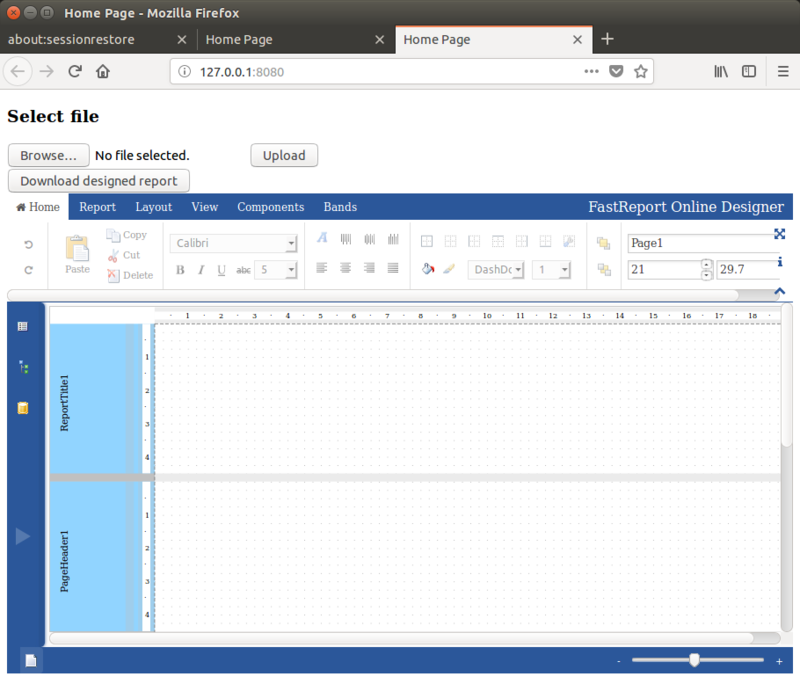 As we agreed at the beginning, in addition to the report designer, the page will contain buttons for downloading the report to the designer and saving the edited report to the local computer. [HttpPost] // The attribute indicates that the method processes the Post request. In the first line, we show a message confirming the saving of the report. Then, we check the report identifier, if it is equal to "DesignReport", then we send the result to the stream. And create a new report template file based on this stream. Thus, the second file will appear in the Home folder – SaveDesignedReport.cshtml. Do you remember, in the Index () method, we specified the web report property? webReport.DesignerSaveCallBack = "Home/SaveDesignedReport"? It's time to set the value of this property if you didn’t know what your view would be called to display the callback to save the report. Here, we display the title. And use the BeginForm helper to create a form with a file upload field and a button. As parameters, this helper accepts the name of the web method from the controller, the name of the controller, the type of request, the way the data is encoded. As far as you remember we created two methods in HomeController: to download the report to the designer and to download the report to the local computer. The names of the web methods in the forms created by the helper must match the names from the controller. As you can see, we also created a form with a button to download the report from the server to the local computer. In the last line of code, we convert the report into HTML format and display it. To do this, use the built-in method GetHtml (), which causes the export of the constructed report to this format (in our case, the designer). If there are no <system.webServer> and <namespaces> sections in the web.config, then add them. At this step we can be considered our little web application ready. Let's run it on the xsp debug web server. Just clock Ctrl + F5. The Browse... button and the label with the file name appeared thanks to <input type = "file" name = "upload" />. 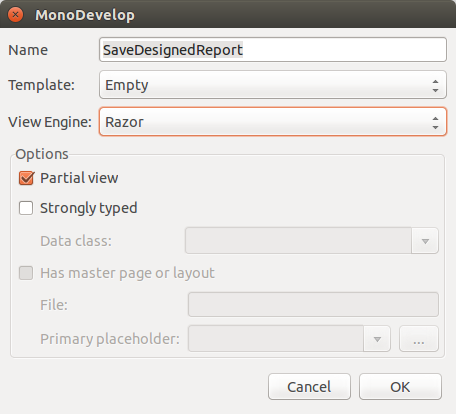 Click this button and select a report template file. After that, the report is ready for download, so click the Download designed report button. A standard browser dialog box appears in which we are offered to download a report or reject an action. Download the report and find it in the downloads folder. That's all. 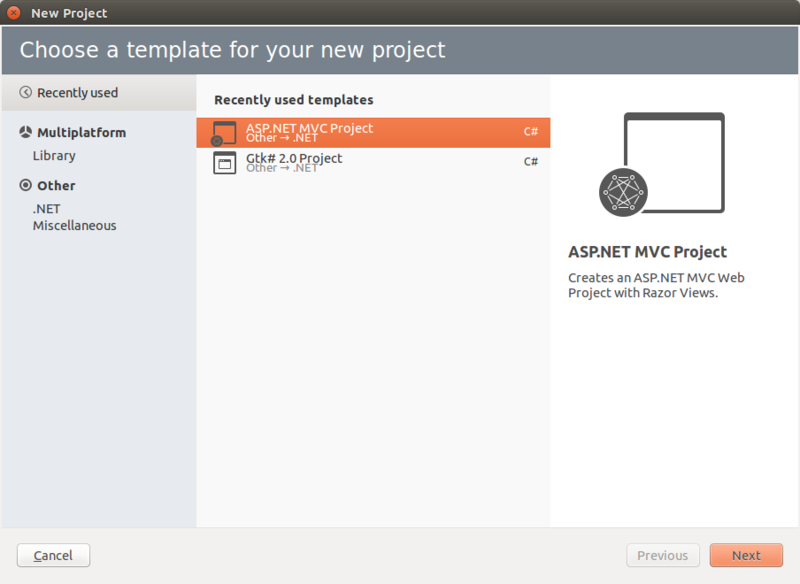 As you can see, ASP .Net web projects on Linux is quite real. Not much more difficult than under Windows. FastReport .Mono. What is it? What for is it?